Pretty well all I knew about Peter Paul Rubens was that he painted women … of a fuller figure. It was a surprise then to begin with a study for John Constable’s The Haywain. I’m guessing I’d only just seen this last year, when I’d done Tate Britain’s Late Turner and the V&A’s Constable exhibitions in one day. Both painters appear to have drawn on Rubens’s romanticised landscapes. I wonder – does this pad out an exhibition which had an odd corridor between rooms? The fuller figures appear quite late, but then the thematic approach – Poetry, Elegance, Power, Compassion, Violence and Lust – obscures chronology. The tricksy subtitle – “From Van Dyck to Cézanne” – is odd, given the inclusion of Pablo Picaso and Oskar Kokoschka, who surely postdate Cézanne and French Impressionism. 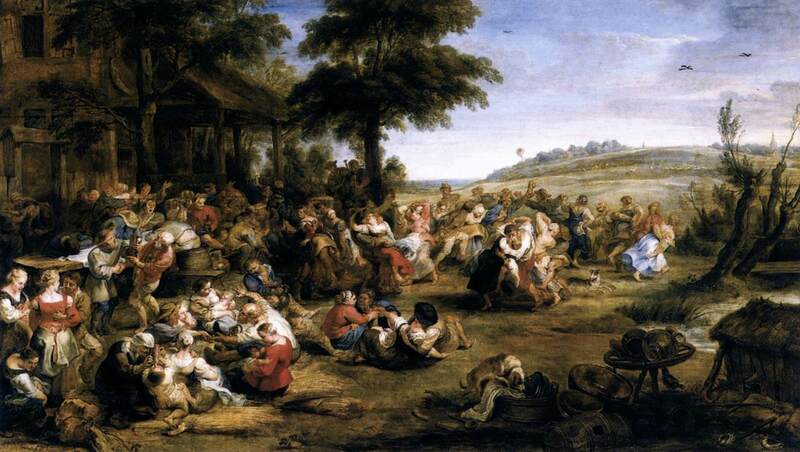 It’s in the falling of the damned that they are first visible – suggesting that gluttony may be a factor. In the penultimate room the women are described as “buxom” and “corpulent”. Tricksy thing, language. Tricksy thing, influence. Oskar Kokoschka’s “Loreley” seems very distant from Rubens, but that’s a corpulent Victoria. Those painters are clearly copying that canvas – but that’s not in the show (“A Flemish Kermis“, for example), nor is there a reproduction. When it’s an altarpiece or a ceiling I guess it can’t always be reproduced. But still. A little visual context. For me, though, the highlight of the exhibition was La Peregrina, a room of twentieth century artists inspired by Rubens, although it’s hard to see how Sarah Lucas’s fried eggs and kebab quite do that. Curated by Jenny Saville, her own black and white drawing “The Voice of the Shuttle” stands out, even among the company of Bacon, Warhol, Freud and Auerbach. These are corpulent rather than buxom. I can’t say Rubens blew me away – I preferred Giovanni Battista Moroni, oddly, a couple of weeks back – but certainly this exhibition definitely held my interest for just short of two hours. On the other hand, the RAA gallery assistants trying to sell audio tours are getting as bad as chuggers and I wish the RAA would decide where its ticket desk is.